Purchased from National Institution in 1854 by Art Union Prizewinner for £80. Art Journal, London, 1854, p. 106. Jan Reynolds, The Williams Family of Painters, 1975, p. 274, pl. 107, illustrated. London, National Institution Exhibition, 1854, no. 247. This is an example of Percy's finest work. It is a carefully drafted composition, meticulous in detail, displaying an engaging narrative of rural labour in a truthful landscape. The subject matter fully illustrates the artist's technical competency, which was widely acclaimed in his day. The theme of rural crafts in such detail is rarely seen in his work. There is one example in the collection of Ferens Art Gallery, Hull, entitled The Charcoal Burners and one other in The Castle Museum, Nottingham, entitled The Fern Gatherers. Percy employed the use of a camera to capture images of everyday scenes shortly after the photographic processes of William Henry Fox Talbot and Louis Daguerre were commercially available. This was not uncommon and though not replacing the artists' sketchbook, was an invaluable addition to their 'tools of the trade'. In a collection of photographs taken by the artist around 1850 we see similar objects and workers to those shown here. It is believed that they, as this scene depicts, were taken from an Osier's yard on the Thames. This painting would have been completed in Percy's studio at Castlenau in Barnes, Surrey. This atelier was one of the most productive in its time, being the home of Percy's father, Edward Williams, senior, himself an accomplished landscape artist. Alfred Walter Williams, the youngest of Edward's six sons also painted from this address as did Walter Williams, Edward's grandson and the son of George Augustus Williams, another of the talented brothers. 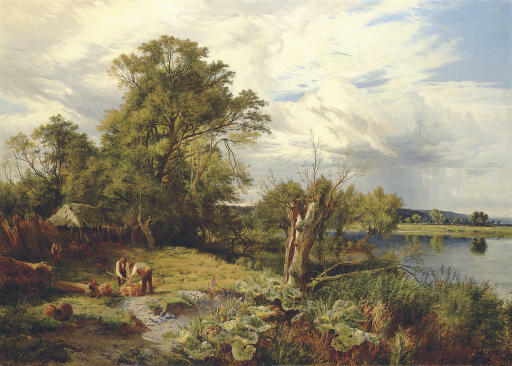 In 1854, the year of this painting's exhibition, Prince Albert added one of Percy's landscapes to the Royal Collection, which he had seen at the Royal Academy's summer exhibition that year. The fine art dealer, N.R. Omell, held an exhibition in 1975 at 6 Duke Street, St James's, London of the works of 'The Williams Family of Painters.' The present painting, no. 1 in the catalogue, was featured on the front cover. The Omell exhibition coincided with the publication by the Antique Collector's Club of the book, The Williams Family of Painters, written by Jan Reynolds, S.R. Percy's great-granddaughter. Once again we see this painting featured, on page 274, pl. 107.